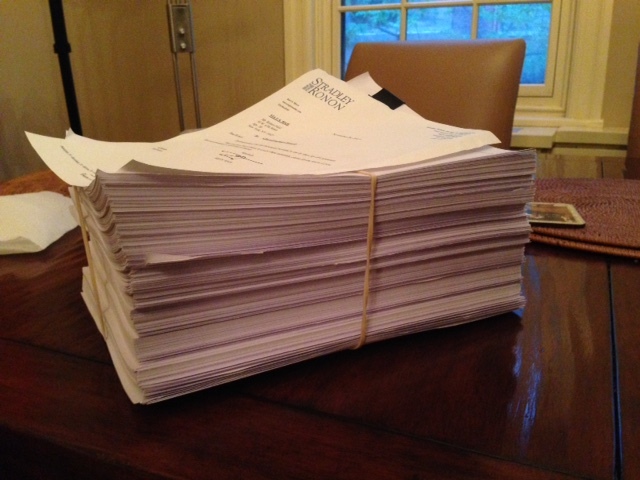 The photo is of eight inches of documents finally made available to NewsLanc as a result of our ‘Request for Public Information’ filing over half a year ago that was stone walled by the City of Lancaster, later ordered to be delivered by the State but yet withheld, and finally made available through negotiation among NewsLanc’s counsel and the law firm for the City. Not all of the file information was made available. Some was withheld on legitimate grounds as being proprietary information. Many exhibits were not included and should have been. As to the possibility of materials improperly withheld, that will be determined as negotiations progress or through court order. NewsLanc seeks to find out if there were improprieties or worse on the part of those applying for CRIZ funding for the Marriott tower expansionas well as by the City and its agencies. Lancastrians should ask themselves why, in the first place, the City and presumably Penn Square Partners did not co-operate with NewsLanc’s legitimate request for the material . Because of defiance of the law, the City and NewsLanc are now incurring many thousands of dollars in avoidable legal fees. Both the city and newslanc should send the legal fees to PSP/lnp to pay. Put the Penn Square Partners in jail.